An innovative project led by a Chemistry academic at the University of Southampton is using solar generators to provide IT resources and ‘hands-on’ science for students in developing countries. A major difficulty in teaching science subjects in developing countries, especially in rural schools, is that students are rarely able to get ‘hands-on’ experience of experiments. This could be partly due to a lack of equipment, chemicals and facilities but mainly because of a lack of electricity and running water. Now, Professor Tony Rest, a visiting Chemistry academic at the University of Southampton, and Keith Wilkinson, formerly a teacher at the International School at Lusaka in Zambia, have devised a solar-powered solution based on a digital projector and low-cost solar energy panels so that students can gain access to IT and other modern teaching methods. Professor Rest says: “The lack of electricity is a particularly serious matter for rural schools and this situation is unlikely to get better in the near to medium future. With drawbacks to petrol generators, due to difficulties in getting supplies and safety hazards, solar energy generators have become available at cost-effective prices and provide a sustainable answer as rural schools have an abundance of the basic energy source required to power them - sunshine. 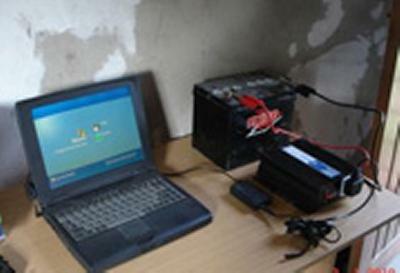 Most data/video projectors require 200-300 watt and cannot be economically sustained by solar power in rural villages. However, the advent of mini-projectors, which require about 50 watts of power, has revolutionised the situation and made battery powered projection feasible. The solar energy generators, which consist of solar panels, batteries and inverters, can be linked to the projector for students to get practical classes via multimedia resources to show laboratory experiments and stress practical techniques. The project has been developed by the ‘Chemistry Aid’ project, the Chemistry Video Consortium based at the University of Southampton, with support from the Royal Society of Chemistry, which has provided multimedia teaching resources.